Ryu is back in the best 8-bit version of this game to ever hit the market. He returns home after finishing some ninja business... Killing people of course. He finds his whole town burned to the ground and his friends and family murdered. Sound like a perfect story for a 1970's Kung Fu flick. Eat your heart out Bruce Lee fans. The gameplay is good with the basic jump and slash techniques for the 1 and 2 buttons. The storyline is fast between stages so you are not reading for five minutes about something you don't care about. 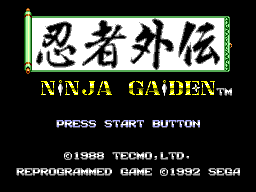 I remember the first Ninja Gaiden for the NES. Reading the storyline hurt the game play because it was to drawn out. It not like that on this one. What happened in the previous stage is spoken then the next mission will be talked about. There are some parts of the game I didn't care for. Sometimes when you enter the next screen there is a pit right next to you. If you don't pay very close attention you will lose a life. Also, there are a few parts of the game that are near impossible to get through. Stage six, for example, is fricken hard. It is the cave, lava will kill you stage while jumping on tiny platforms and dodging flying enemies. Fun!!!!! Use your secret ninja bomb technique while jumping with ninja accuracy on pin sized platforms. There is a assortment of weapons and some new moves that are not in any of the other Ninja Gaidens that are on other 8-bit consoles. 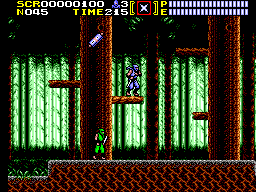 Hang from tree branches, jump from wall to wall and the secret ninja bombs are a must to master. 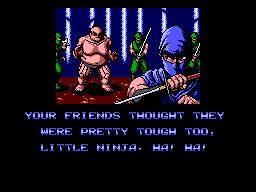 By far the best 8-bit verision out of the Ninja Gaiden series. The characters are very detailed and the sega logo is in the back ground throughout some of the stages. Like in the box weapon in double dragon. Don't forget what system you are playing. The weapons are detailed and the bosses are in great colour. The music is something you can actually catch yourself humming through a work day. I like stage two music the best, but I liked all of the series music for the most part. I own the Arcade Machine and it plays Black Sabbath when you fight the bosses at the end of stage two. The sound is as good. You can hear the sword slash when you hit something. Besides some of the hard end levels, the games control is excellent. There is a ice stage that Ryu can slide around in stage 5. Stage six, seven and eight are hard. Get ready to use the continue options a few times if it is the first time you play those level. Master the wall jump and the hanging technique if you plan to beat this game. This is a classic and is a must have. I don't see it all the time on eBay, so you know it is either rare or a good game. People don't want to part with a great game that they grew up playing. I'll play it tonight before I good to bed and dream I'm a ninja saving the world.... or a Master teaching Martial Arts. One of the two. If you don't have this in your collection, get it. It is what I call a cult classic game. Any true Martial Artist needs to have a collection of Kung Fu Films and Ninja Video Games. This one is perfect for your collection.